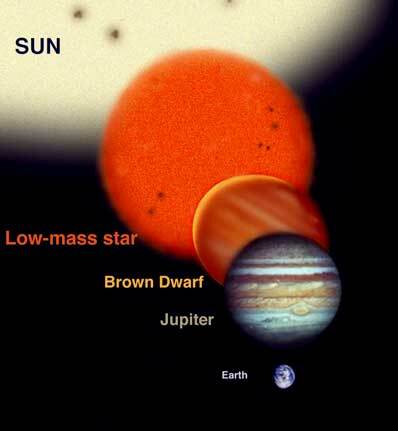 Somewhere between a True Star ( a low mass red dwarf star) and a Gas Giant Planet are the Brown Dwarfs. Although they may not be much larger than Jupiter in size they are far larger in mass. The upper mass for a brown dwarf is that which is just insufficient for normal hydrogen fusion to be triggered in the core. Based on theoretical considerations, this is believed to be between 0.075 and 0.080 solar mass, or 75 to 80 times the mass of Jupiter. The lower mass limit is somewhat arbitrary as there is no obvious point of transition between a high-mass planet and a low-mass brown dwarf, but it is generally taken to be about 0.013 solar masses or about 13 times the mass of Jupiter. Brown dwarfs are too cool to give off much visible light but they do emit substantial amounts of radiation in the infrared as a result of slow gravitational contraction and the fusion of deuterium and possibly lithium. They are thus amenable to detection by ground-based and spaceborne infrared telescopes. As in the case of extrasolar planets, brown dwarfs can also be found if they happen to be orbiting a star. 'Small' brown dwarfs burn deuterium (Deuterium + Proton gives helium 3) at around ½ million degrees Celsius. Higher mass brown dwarfs burn deuterium at ½ million and lithium at around 3 million degrees Celsius.